We hope that you and your family have been having a wonderful summer. I am often asked why we need to study the human brain to understand autism. Can’t we just study mice brains and figure out what is different in autism? There are many answers to this question. At a global level, it is clear that the human brain is not simply a scaled-up mouse brain. There are many parts of the human brain that are absent or very primitive in rodents such as the mouse. As it turns out, regions of the so-called frontal lobe show the most striking differences between mouse and human brains. This is important because the frontal lobe is critically important in social behavior and executive function which are often impaired in autism. So, it may be that the parts of the brain that are altered in autism don’t even exist in the mouse brain! But, even in regions of the brain that exist in both the mouse and the human, it is probably the case that the underlying circuits are different. Neurons make up the machinery of the brain and their interconnections form the circuitry that produces behavior. Over a century ago, a famous Austrian psychiatrist and neurologist Constantin von Economo discovered “spindle cells” (which are now often called von Economo cells) in the frontal lobe of postmortem human brains. Subsequently, these cells have been found in other large-brained species such as whales and dolphins but have not been found in the mouse brain. 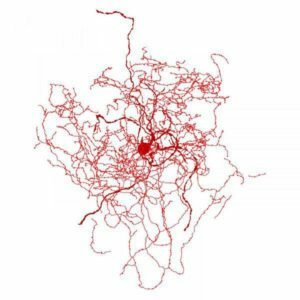 More recently, investigators at the Allen Brain Institute in Seattle have discovered another type of cell (called the Rosehip cell) that is in the cerebral cortex of humans but not of mice (Boldog et al 2018). They suggest that the rosehip cells play an important role in information processing. This finding is probably the tip of the iceberg and with the advanced genomic techniques that are now in use, it is likely that many cells will be discovered that are unique to the human brain. So, the answer to the question of why we must study the human brain is because it is unique. And, understanding its organization and function will be critical to understanding the alterations that lead to uniquely human psychiatric disorders such as autism. Therefore, we continue to enlist your aid in spreading the word about the critical need for postmortem brain donations. Our team will always provide a sensitive and supportive process for families to make this most precious of gifts. Boldog E, Bakken TE, Hodge RD, Novotny M, Aevermann BD, Baka J, Borde S, Close JL, Diez-Fuertes F, Ding SL, Farago N, Kocsis AK, Kovacs B, Maltzer Z, McCorrison JM, Miller JA, Molnar G, Olah G, Ozsvar A, Rozsa M, Shehata SI, Smith KA, Sunkin SM, Tran DN, Venepally P, Wall A, Puskas LG, Barzo P, Steemers FJ, Schork NJ, Scheuermann RH, Lasken RS, Lein ES, Tamas G. 2018. Transcriptomic and morphophysiological evidence for a specialized human cortical GABAergic cell type. Nat Neurosci.